It comes as net migration estimates show it remains near record levels, at 327,000 for the year to March. The figures - for the period before Britain voted to leave the EU - are down slightly on the previous year. There were an estimated 831,000 Polish-born residents in 2015 - a jump of almost 750,000 compared with the number in 2004, the year the country joined the EU. India and the Republic of Ireland have traditionally been the sources of the UK's largest foreign-born groups. The latest net migration figures show a slowdown in the numbers settling in the UK from Poland and seven other former Eastern bloc countries - but that was offset by an increase in net migration from Bulgaria and Romania, which hit record levels of 60,000. Nicola White, ONS Head of International Migration Statistics, said: "Net migration remains at record levels although the recent trend is broadly flat. "Work remains the main reason for migration, followed by study which has seen a significant fall in the number of people coming to the UK for education. She said the UK's population continued to increase between 2014 and 2015, driven by "significant increases in both the non-UK born and non-British national population of the UK". ONS estimates show 13.3% of the usually resident population of the UK were born abroad, compared with 8.9% in 2004. The region with the highest proportion of non-UK born residents, at 37%, is London. 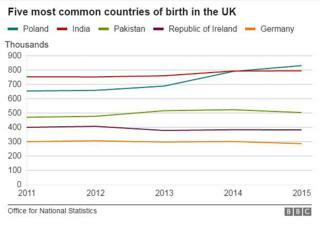 More than 25% of births in England and Wales in 2015 were to women born outside the UK, the highest level on record, according to separate figures. ONS statistician Elizabeth McLaren said: "The rising percentage of births to women born outside the UK is largely due to foreign born women making up an increasing share of the female population of childbearing age in England and Wales. "Part of the reason for this is that migrants are more likely to be working-age adults rather than children or older people. Alongside their increasing share of the population, higher fertility among women born outside the UK has also had an impact." The immigration statistics contain few surprises, with net migration still a long, long way from the government's target. There are a few signs - from more recent data on national insurance number registrations - that EU immigration may have reached its peak, but it won't be for another six months at least before we're able to gauge the effect, if any, of the referendum. The figures came as Sir David Metcalf, the government's chief adviser on immigration controls, suggested Prime Minister Theresa May was considering introducing work permits for low skilled migrants from the EU. Sir David, head of the Migration Advisory Committee, told the Telegraph the scheme would be "pretty straightforward" to run and could be based on a previous work permit system for seasonal agricultural workers. Mrs May came under fire when she was home secretary for failing to meet the government's target of getting annual net migration below 100,000. She has said that reducing net migration will be her "absolute priority" in Brexit negotiations. A report by think tank British Future, released ahead of the latest figures, said the vote to leave the EU was a chance to fix the UK's "broken" immigration system and restore trust in controlled migration. Lord Green, of the Migration Watch pressure group said: "The Brexit negotiations must achieve a significant reduction of EU migration and very firm action is needed against overstaying students from outside the EU." Labour's Shadow Home Office minister Carolyn Harris, said: "These figures are a reminder of Theresa May's failings as home secretary. "Once again, the Tory promise on immigration lies in tatters and net migration remains more than three times their target." But she said Mrs May "must not sell the country down the river during Brexit negotiations on the movement of people just to cut these numbers" and urged her to tackle skills gaps and protect wages.